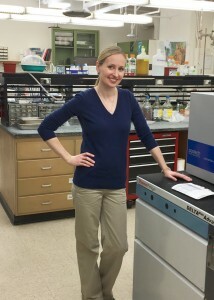 Facilitating the following types of sample analyses for USDA/ARS and CSS researchers: Coupled Elemental Analysis and Isotope Ratio Mass Spectrometry (EA-IRMS), Total Organic Carbon and Nitrogen Analysis (TOC/TOCN), Fourier Transform Infrared Spectrophotometry (FTIR), Ion Chromatography (IC), Gas Chromatography (GC), and Segmented Flow Analysis (SFA). All instrumentation is located in Johnson Hall 224. King, J.L., G.E. Edwards, and A.B. Cousins. 2012. The Efficiency of the CO2-Concentrating Mechanisms during Single-Cell C4 Photosynthesis. Plant, Cell & Environment. 35: 513-523. King, J.L. 2010. Crassulacean Acid Metabolism as an Enabling Trait for the Epiphytic Growth Habit in Orchidaceae. Lindleyana.